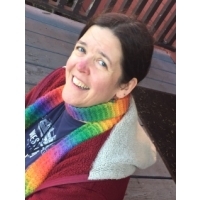 Tanya McDonald writes haiku (and related forms), as well as urban fantasy. She's hoping to someday combine the two. She is involved in Haiku Northwest in Washington and has an affinity for chickens. minute of silence . . . Credits: "courthouse clock tower" - Bottle Rockets 19 (2008); "minute of silence" - The Heron's Nest XI:2 (2009); "Jedi mind trick" - Modern Haiku 40:1 (2009); "ailing economy" - Bottle Rockets 21 (2009); "green light" - Bottle Rockets 20 (2009); "salmon run" - Magnapoets 3 (2009).